China is both the world’s largest producer and the world’s largest importer of iron ore. This can result in some curious dynamics in the market, especially when China’s internal supply and demand for iron ore become unbalanced. Recent developments form an interesting case study. The Chinese government has been getting tougher on smog, and this means cutting steel production, which is a major source of pollutants. How will this affect global iron ore markets? Alternative data may hold the answer. The Chinese government has made it a policy priority to reduce the smog that envelops many of its cities during the winter months. A major source of this smog is the activity of the steel factories that drive much of northern China’s industrial economy. Beijing announced in January 2017 that they would curtail steel production by half from mid-November to mid-March in the northern cities surrounding the capital. Predictably, these announcements sent shockwaves down the global steel supply chain, chief among them producers of iron ore, the main ingredient in the steelmaking process. The new regulations have hit Chinese ore producers especially hard because of the type of iron ore they typically produce: low-grade sinter. Low-grade iron ore must first go through the process of “sintering”, where iron ore fines are melted into a larger mass as preparation for the steelmaking process. This is an inefficient and dirty process. As such, Chinese steelmakers have for some time been trying to reduce their use of domestic low-grade iron in favor of higher-grade pellets and lump ore, which produce more steel while causing less pollution. The recent policy directives are expected to accelerate this shift. This higher-grade ore is typically imported from Australia and Brazil; Beijing’s crackdown might, paradoxically, lead to increased demand for ores from these countries. Demand for lower grade iron ore has plummeted in recent weeks. Deutsche Bank estimates a reduction of approximately 10.2mt of iron ore production in China between October 2017 and March 2018 because of the steel curtailment. How the Chinese government will implement the regulations remains unclear. For instance, though the official announcement stated that reductions would begin in mid-November, the city of Tangshan was ordered to implement changes in October — one month ahead of schedule — because of a surge in smog reports. This policy uncertainty makes it even harder to predict the behavior of the iron ore market. Chinese steel curtailment is expected to have two opposing effects on international iron ore producers. While the general reduction of steel production in China will undoubtedly reduce the overall demand for iron ore, the intense crackdown on domestic supply has created a surge in demand for high-grade iron ore from Australian and Brazilian producers. The million-dollar question for these producers is, which effect will predominate? While iron ore prices are easy to observe, iron ore production and export volumes are more difficult to assess. And it is the quantity of iron ore sold that is the key revenue driver for commodity majors like Rio Tinto, BHP Billiton and Fortescue Metals Group. Quandl has exclusively partnered with a shipping data and analytics firm to create daily estimates for iron ore exports and sales for three of the largest Australian iron ore exporters: Rio Tinto, BHP Billiton and Fortescue Metals Group. By tracking vessel counts and load factors at ports dedicated to ore exports, we are able to estimate iron ore sales for each producer with very high accuracy, weeks to months in advance of official publication. 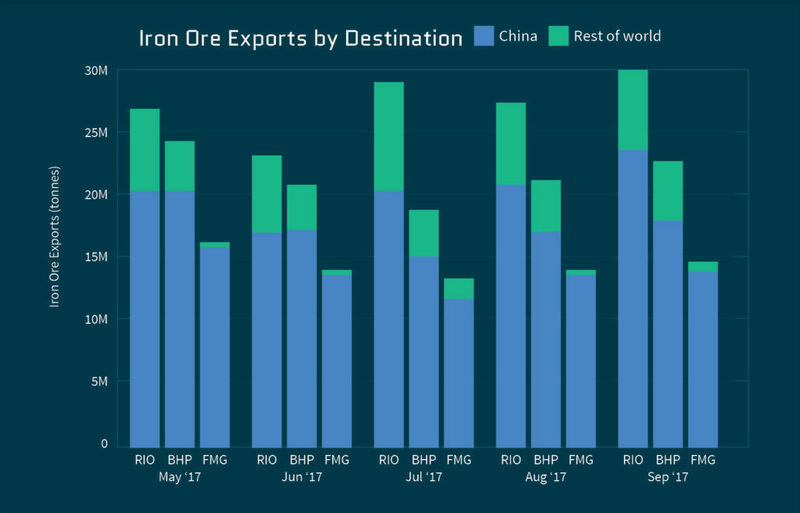 Over recent years, China has been the biggest consumer of iron ore mined by all three Australian producers, which is consistent with the estimates from the Government of Western Australia: Both Quandl and the Australian government calculate that China accounts for roughly 82% of Australian iron ore exports. We have been using our data to track the impact of Chinese steel policies on Australian producers. Thus far, production in 2017 has not exhibited any substantial deviations compared to that from 2016 — but that may not last. We will be watching closely to determine whether the rise in demand for high-grade iron ore will outweigh (or at least compensate for) the negative effects of the seasonal steel production suspension. November — which is the deadline for 28 cities in the north to curtail iron ore and steel production — will likely be a major determining factor. We will share our findings as developments arise. In the meantime, if you would like to perform your own analyses on this dataset, please reach out.